Features a soft touch easy grip handle to make holding the kettle easier to hold. The cordless nature of the kettle means that it is also easier to use. It is low wattage which means it is cheaper to run and can be used at campsites without tripping the power. Twin water level indicators mean you can tell how much water is in the kettle from either side. 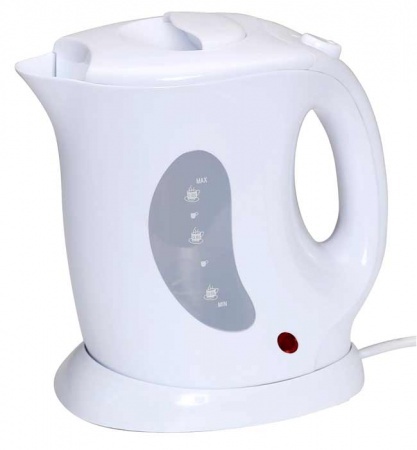 It has a compact 1L capacity which means the kettle is smaller and easier to store away. It has high quality stainless steel heating tubes and a heat resistant body. The filter is removable making it easier to clean and maintain. The power switch doubles up as a power indicator light so you know when the kettle is turned on. The kettle automatically turns off when boiled and can be manually overridden at any time giving you complete control. It has a built in safety cut off against evaporation and overheating and has a safety snap shut lid that can be operated single handed. This is an ideal kettle for those looking for a small low budget kettle, a second kettle or just when space is at a premium. The small size 1 litre capacity gives it a very small footprint thus making it easy to store away when not in use.